What a magnificent release. That's just about everything, is it not? It's missing a handful of films from this official filmography (Lifters, Little Villain, Everyday Thieves, The Man Who Couldn't Stop Lying, The Curious World of Frinton-on-Sea, The Men Who Sleep in Trucks) though to be fair it also includes several films that filmography is missing! I wonder if Invention for Destruction is still forthcoming the following week. Will they really put out these two, Daisies and Diamonds of the Night before year's end? That's almost half of their supposed 2018 slate in four months, and nine titles in the year total. Full details now up at our website - and available to buy for immediate dispatch. 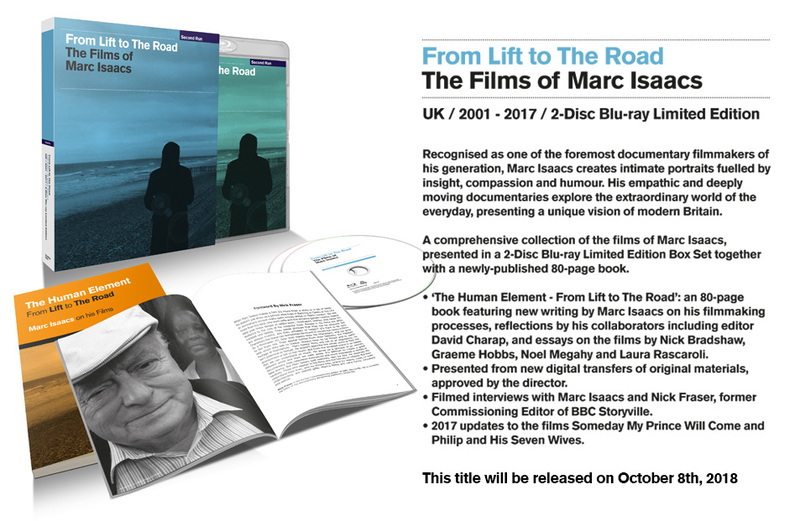 "A British documentary maestro who's been building a remarkable body of humanist work since 2001, Marc Isaacs remains largely unknown outside the UK except to those devoted enough to import the handful of home video releases of his work. Second Run has been banging the drum for his output... they've really outdone themselves by consolidating everything into a 2018 two-disc Blu-ray set that also adds quite a bit more, serving as a substantial upgrade all around and providing the best overview yet to a filmmaker well worth discovering." I suspected most of the films would be sourced from standard def materials, but even those look better than their previous DVD incarnations to my eyes. The source material is hardly a fair blemish against what looks like Second Run's most comprehensive release to date - and the sturdy packaging (similar to a lot of Arrow's limited edition cases) is the icing on the cake. I hope you guys have plans for the future which could match or top this release. "But there are no two ways about it – what we are dealing with is 'home media release of the year' material. Second Run have put in an incredible and insane level of effort in their newest Blu Ray release; documentary buffs will crave over owning a limited edition copy of the set... 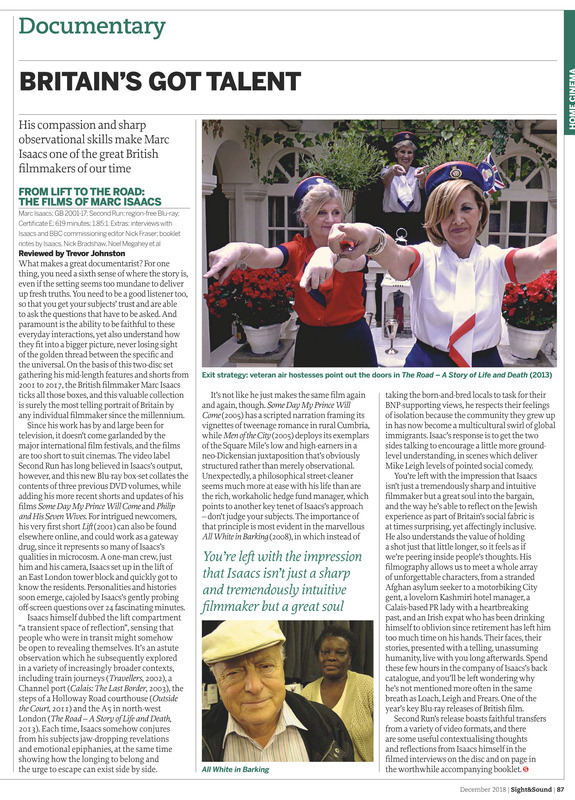 There are many stops and places to visit in Isaacs’s world, and with that varied range of options for documentary fans, the box set is a dream come true". Spend these few hours in the company of Isaacs’s back catalogue, and you’ll be left wondering why he’s not mentioned more often in the same breath as Loach, Leigh and Frears. One of the year’s key Blu-ray releases of British film."